Lots of visitors come to Spain knowing there’s a lot of good food to be eaten here. But many may be wondering...what is tapas food? There are actually lots of misconceptions about tapas out there. We’re going to help you learn all about the delicious world of tapas. This is one dining experience you certainly won’t want to miss while you’re in Spain! Tapas actually refers to style of serving food, rather than specific dishes. However, this doesn’t mean that there aren’t classic dishes that you’ll find in any decent tapas bar (we’ll have more on that in a minute). First, a “tapa” is simply a small portion of food. Anything can be served tapas style! When you go for tapas, you’ll end up ordering lots of small plates and sharing. This way, you can try a selection of different dishes all at once. 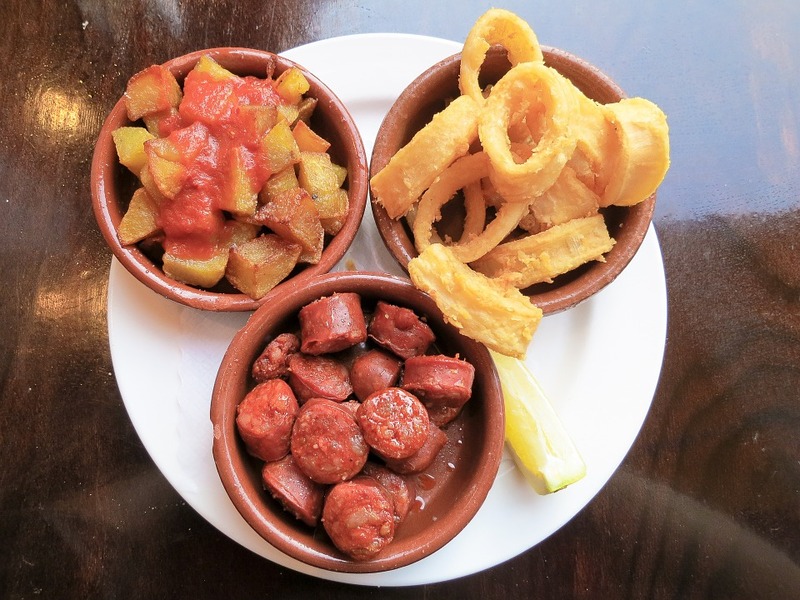 The most common story behind the origin of tapas is that they started out as small slices of meat or bread served in bars that patrons could use to cover their drinks to keep flies out. “Tapas” is the Spanish verb for “to cover”. Bit by bit, the small bar snack started becoming just as essential as the drinks. They also started becoming more elaborate. Today’s tapas are much more sophisticated. You’ll find tapas ranging from small dishes of olives to elaborate culinary creations. There are even tapas contests to create the very best ones! OK, history lessons are well and good. Now you know how to answer the questions “What is tapas food?” from a historical perspective. But we bet you’d rather find out what to eat at a tapas bar! Because tapas are a style of serving food, they can be anything. But there are certainly typical tapas that you’ll find at most traditional tapas bars with Spanish food. These chunks of fried potato topped with a spicy tomato sauce are a definite crowd-pleaser. This means they make an ideal tapa to order while you’re still looking at the rest of the menu picking what you want to eat. Anchovies soaked in vinegar may not be everybody’s favorite dish, but if you like fish, you’ll want to try this tapa. These fried squid dishes are best enjoyed with a generous squeeze of fresh lemon. The south of Spain does especially good fried seafood, so don’t forget to order a serving of either one of these. Chopitos are another similar dish, though as they are whole fried baby squid, they’re not a good choice for less adventurous eaters. This is nothing like the flat Mexican tortillas you may be familiar with. Instead, Spanish tortilla is more like a crustless quiche, with eggs and potatoes (and sometimes onions). Literally “Moorish spikes”, these are skewers of roasted meat coated in a generous amount of spices. The most common meat is pork, but you can sometimes find chicken or beef versions. You’ve got to try some of Spain’s famous cured meats while you’re in the country. The most popular is jamón, which you can order in a tapa or in a sandwich. Try a tapa and see how you like it. For vegetarians, order a plate of cured Manchego cheese instead. “Russian salad” is a Spanish potato salad with tuna, mayonnaise, peas, carrots, and olives. These tiny green peppers come packed with punch. As the saying goes, “Some are spicy, some aren’t”. So, don’t look surprised if you suddenly bite into a spicy little pepper! Wine-soaked chorizo makes for a hearty tapa that’s bursting with flavor. Make sure to order some slices of bread to soak up the delicious sauce. It’s hard to find somebody who doesn’t enjoy croquettes. These small fried snacks come filled with meat, fish, or vegetables cooked in bechamel sauce. You may find yourself eating more than one. Mmm…all this talk about tapas is making us hungry! So that means we’re off to find the nearest tapas bar and order up some food. We hope you’ve enjoyed learning all about the tasty world of tapas. Now, next time somebody asks you, “What is tapas food like?”, you’ll be able to give them an expert answer!